Life is full of tough decisions. Trump vs Hilary (Lord help all of us). Canal vs river. 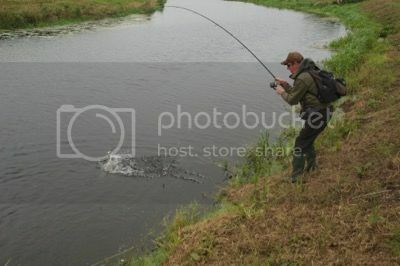 Pike fishing vs trout fishing. Some are tricky because all the options are tempting. Others are tougher still because none of the options fill you with much joy. My life is full of these tricky calls because, paid fishing hack or not, my time is limited. My whole summer seemed like an example of this. Yes, I did some cool things, like kayak fishing and a lot of LRF. But it’s the things I have to drop that kill me. I didn’t get round to fishing the canal for carp. I hardly fished the pole, a method which I love. At least autumn makes for easier choices, because I would sooner saw my legs off than not fish for pike once the colder months arrive. But this blog is yet another tough decision. What exactly do I publish and what do I leave out? I would love to share the lot with you, but simply have to keep hold of enough juicy bits and detail for my articles in the non-virtual world. Indeed, the digital age can be a curse as much as a blessing for anyone who writes for a living. Even with major news sites and media sources, it seems totally normal for many contributors to get on the ladder by working for nothing, essentially. Great you might think- until you realise that the massive increase in quantity comes at a heavy cost in terms of quality. But I digress. We’re all going to have to get smarter- but also stand our ground. 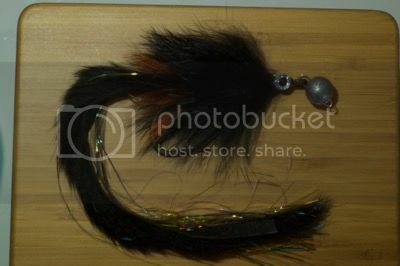 I’ve found that by using the typical ball weights, with detachable loops (aka “Cheb” weights, above) used by jig anglers, it is a piece of cake to add a pike fly rather than the usual hook and rubber lure. Very simple, but works a treat! Could be a cracking way to fish for my lure angling pals who want some of the benefits of fly fishing without investing in all the kit and casting lessons. Also good for the allrounder though, in swims and fisheries with limited casting space. I also have a decision about what I should tell you about one or two discoveries sure to split opinion. Such as seeing a seal on the River Tone! I kid you not. It was on a piking session with John Deprieelle (who takes a mean picture- like the opener for this post). At first light we thought it was an otter, before we got a better look and it was way too big. The local club are extremely worried to say the least. 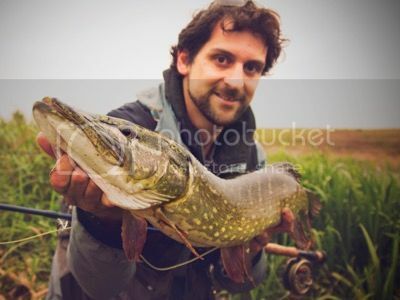 It can get through a fair weight of fish per day, and is already leaving bits of chewed up pike and chub strewn about. What do you do? Given the scare, it’s probably little surprise we found bites a bit hard to come by for much of the day. That said, we did respectably well, sharing seven pike once things settled down a bit and we had travelled a good distance from the rampaging seal. Probably as well to make a little hay before more fish disappear down the gullet of old blubber guts. It almost makes you jealous of fisheries that only have otters to deal with! In spite of the seal though, it was a brilliant day out and a long overdue session with John, who is one of those anglers who you sense is extremely capable but lacks that deadly serious ego that sometimes afflicts the specimen hunter. Perhaps the best moment of the day was hopping little side drains though. 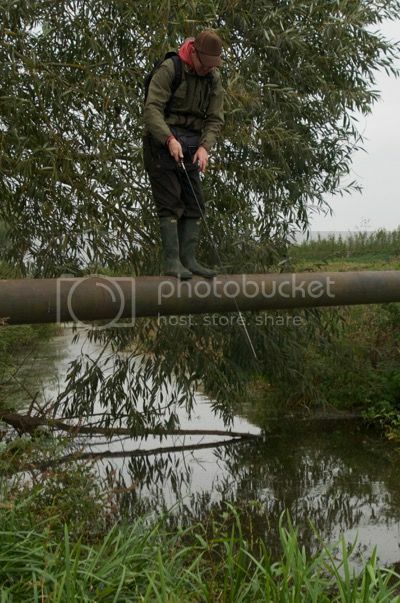 I thought John had lost the plot when he suggested we cross one of these channels via a dodgy old pipe. However, not only did he walk along it, but paused half way to do some jigging. My laughter quickly turned to amazement as he extracted a perch from about twelve inches of mucky water! Naturally, there were no seals in the sea when I met up with Andy Mytton a little later (because what on earth would they be doing there?). But I did have a very fascinating Sunday fishing trip in Dorset, hopping between spots and species in quick succession. Suffice to say I’ll be doing more with Andy in future because what he does is fascinating. Some of it is genuinely new ground, even in the brave new world of LRF. But what I like best about it is that this evolving style of lure fishing is both quite grown up and technical, but also brilliantly trigger happy and almost childish. Like tackling harbour walls and rocks with split shot rigs and tiny hooks, while watching what I can only describe as miniature scale violence kicking off. 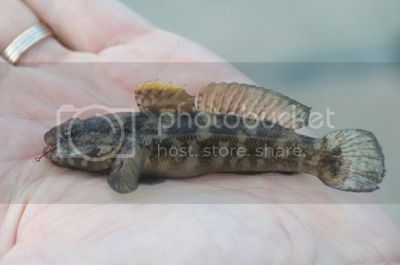 Seriously, if this was a Channel Five series, it would be called “GOBY WARS” or “BRITAIN’S MOST BRUTAL BLENNIES”. And I’d probably watch it. Even more eye-opening though was a whole stack of garfish turning up around the coast; bearing in mind this is October and not a balmy summer evening in July. We ripped little soft lures in, receiving chases and hits galore, but nothing stuck. We must have had sixty plucks each, it was getting dark and we still hadn’t had a fish. 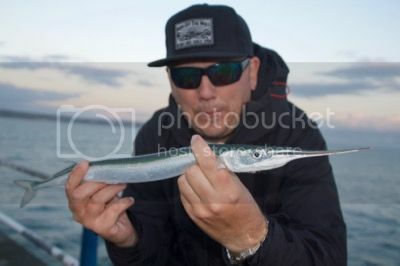 Lure fishing for garfish must be one of the most frustrating things ever, but so compelling. There were oohs and aaahhs galore. More than at a firework display, thought Andy. I’d liken it more to watching a football team with great build up but the world’s shittest striker up front. So many damned chances, but still zero on the score sheet. We were hopping up and down with frustration- but I can’t remember the last time I laughed so much at a daft fish. “If I catch one I’m going to slap it” were my exact words. So what was the answer? Well, the tactic of cast, cast, cast, cast, cast, cast didn’t seem to be working. At some point there was a scratching of heads and a sort of desperate concocting of plans B, C and D. We tried scaling down to tiny little lures and jig heads, which landed a fish for Andy. For me, I managed a couple of late gar by adding a little stinger hook, literally a size 14 match hook, flying loose behind my soft bait and tied directly to the bend of the jig head (a 2g, size 8 model). We added further species after dark too, and Andy revealed some tactics and species which fairly frazzled my mind. But you’ll have to watch this space for more on these and other scores. Sorry. The only other recent fishing of note, in fact, was a fly fishing trip to Devon’s Bellbrook Fishery with both Ben and John Garnett in tow, which proved a bit of a tough nut on this occasion. We really had to chop and change the flies to keep the takes coming to say the least. Both mini lures and spiders got a look from me, without ever really cleaning up. 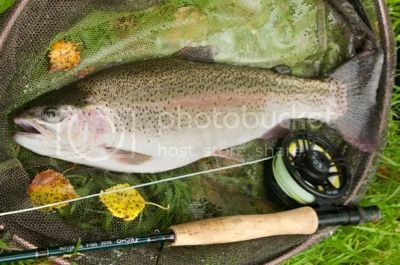 How’s this for a perfect, full-tailed autumn rainbow trout though? 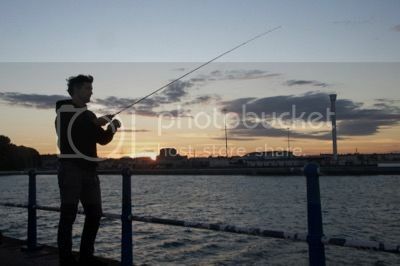 Still, the fishing is bound to improve as things get cooler. As always I’ll also be updating the Turrall Flies blog with more content and fly fishing news each month. If you haven’t checked recently, Chris Ogborne has just provided some great tips on fly fishing for grayling. Just click here to read it. Now what are we going to do with that seal? A blunt object and some heavy lifting gear? Or shall we call it Elvis and feed it mackerel?